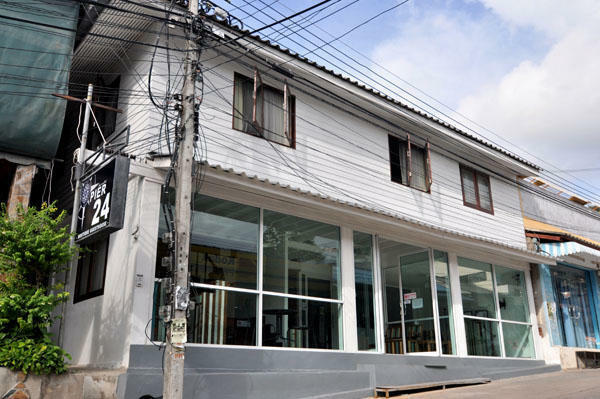 Pier 24 Boutique Guesthouse is located in Mae Haad just 50 metres from the piers and 10 minutes walk from Sairee Beach. The reception is located inside Planet Scuba which is opposite the Seatran Pier in the car park. From here, guests can enjoy easy access to all that the lively city has to offer. For sightseeing options and local attractions, one need not look far as the hotel enjoys close proximity to Sairee Beach, Mae Haad, Sai Nuan Beach. - We provide lockers in dorms. Please bring your own padlock. - A refundable key card deposit of 500 Baht will be collected upon checking in. This will be returned to you when you return the key card to us when checking out. Koh Tao is serviced by ferry services from Surat Thani (4 hours day boat, 9 hours on overnight boat), Chumphon (1.5 to 3 hours), Ko Samui (approx 2.5 hours) and Ko Pha Ngan (approx 1 hour). All ferries dock at Ban Mae Haad. Journey times vary due to the different boats used by the various ferry companies. Ticket prices are the same for Lomprayah and Seatran, and Songserm is less expensive. However, the boats themselves differ greatly. The two main ferries are Lomprayah and Seatran. Lomprayah offers the quickest service on their catamarans and also have VIP lounges where passengers can watch movies in an air conditioned lounge. In contrast, Songserm is a no-frills point to point fast ferry, where most passengers disembark slightly more green in the face than when they boarded. Seatran is the middle option less frills but not as basic as Songserm. Lomprayah offer services from Chumphon (mainland) to Koh Tao and the surrounding islands. Seatran and Songserm only offer service from Samui. Ko Tao has no airport, so anyone wishing to fly would need to fly to Koh Samui Airport and then transfer over on a ferry. Another option for flying down from Bangkok is to fly to Surat Thani Airport, and then catch the boat over after a bus ride of 2 hours to the ferry terminal from the airport. Flights to Surat Thani are much cheaper than flights to Samui, and budget airlines such as Air Asia (and previously Fly-1-2-go who currently aren't flying) service the airport from Bangkok, Chiang Mai, Krabi and Phuket. A flight from Bangkok costs around 2000 Baht one way, and a ferry from Surat Thani costs around 650 Baht including coach transfers. But now, the easier way is to fly to Chumphon and take ferry directly to Koh Tao without having to stopover in other island. You can fly from Bangkok Suvarnabhumi airport to Chumphon airport with Happy Air (www.happyair.co.th). In Chumphon airport, you can buy vans and ferry ticket to Koh Tao.